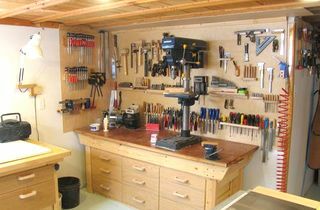 A lot of people use pegboard to hold tools within easy reach on the wall. 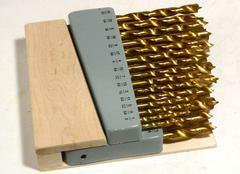 While offering lots of flexibility, I personally find pegboard a little ugly. 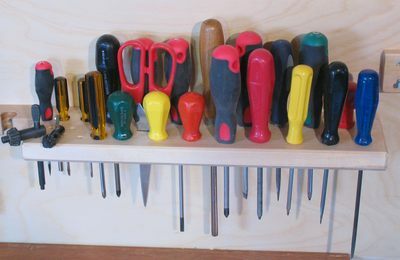 It's much nicer to make a bunch of custom holders out of wood to hold the various tools. Of course, making these is surprisingly time consuming, but the result is very satisfying. 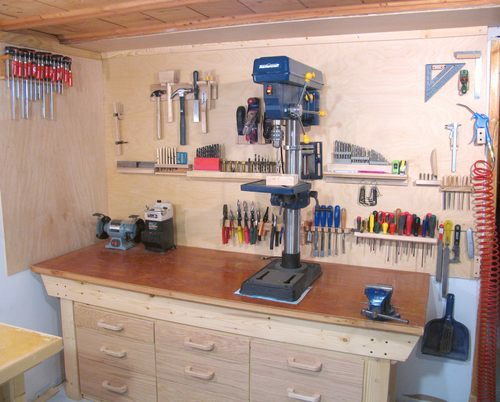 The picture above shows the wall above my workbench with the drill press on it. I moved the drill press out of the way to take these photos. The screwdriver holder is easiest to make. It's just a board attached to the wall, with a lot of holes in it. There's also a slot to hold the scissors. Because it's just to the right of the drill press, I use some of the holes for drill chuck keys. 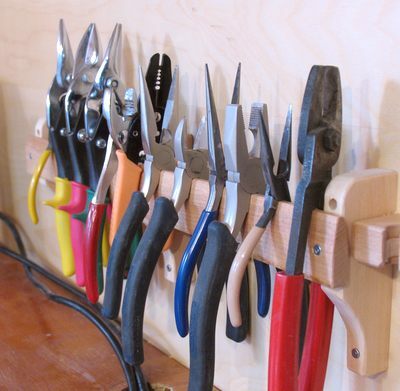 To hold a lot of pliers, it's easiest to just hook them onto the edge of a piece of wood. 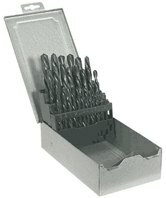 A lot of pliers go in a small amount of space that way. The piece of wood in this holder is tapered towards the top edge, so that it doesn't force the handles too far apart. It's really only about half full with pliers so far. 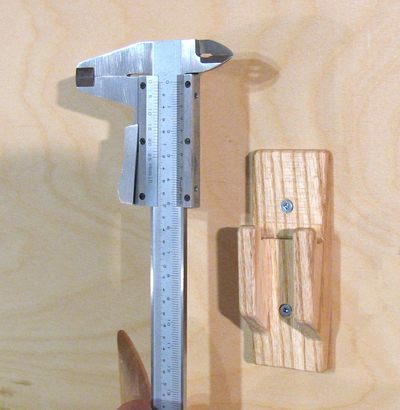 The caliper holder is a neat shaped piece of wood. It has a channel in the middle for the bar of the calipers, and a hook on either side to hold the sliding part. I mounted this so it's not far from the table saw, because I use the calipers in combination with the table saw most often. I also have a dial caliper, but I keep that one in a case in the drawer. The vernier calipers are pretty much invulnerable to dust, whereas anything fancier might get gummed up. 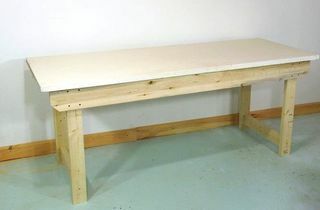 The chisel holder was another fun one to build. I drilled the holes so that they just touch the edge of the piece of wood, then cut in from the edge to the holes, so it's possible to slide the chisel in from the front. 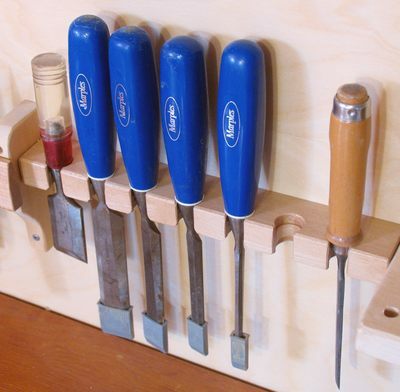 The holes are slightly wider at the top and bottom - Wider at the top to better catch the handle, and at the bottom to give room for the wider chisels. I dimensioned it to work best with the marples chisel set, although it works with my other chisels too. 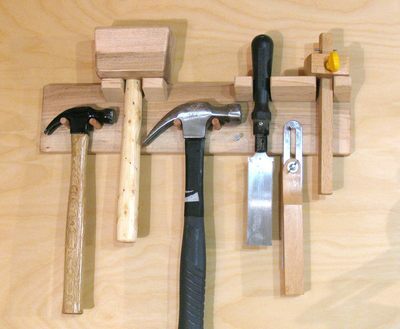 A holder for the hammers. The wooden mallet at the left is home made. Easy enough to make one. I don't understand why people buy them when they are so easy to make. On the right side is the marking gauge, and miter gauge, and a funny fine toothed saw hanging to the left of those. 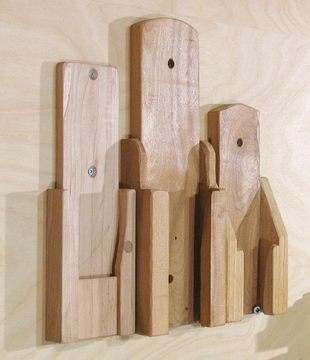 Holders for the hand planes. These are very time consuming to make. 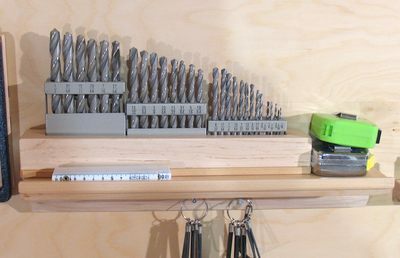 I figured I might want to get the drill index closer at hand at times, so I made a holder for the drill index, and put it on a shelf. 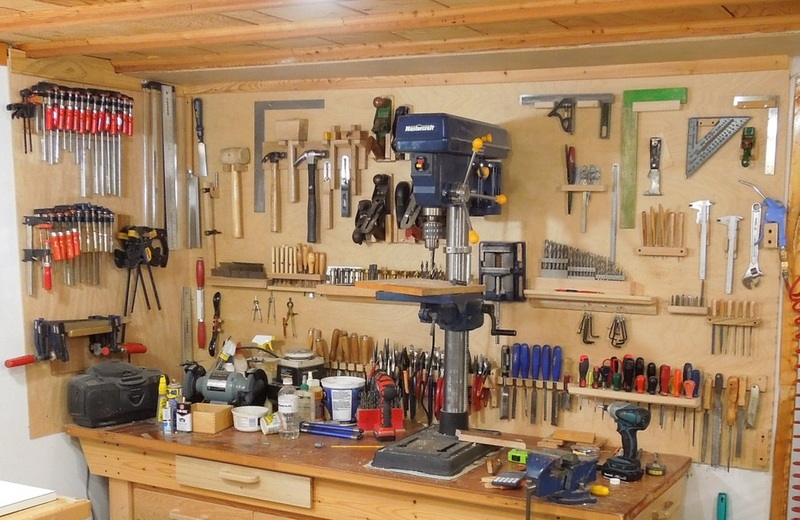 Originally, my drill index was the type that came in a metal box like the one at right, but that sort of box does not lend itself well to putting it on a narrow shelf. 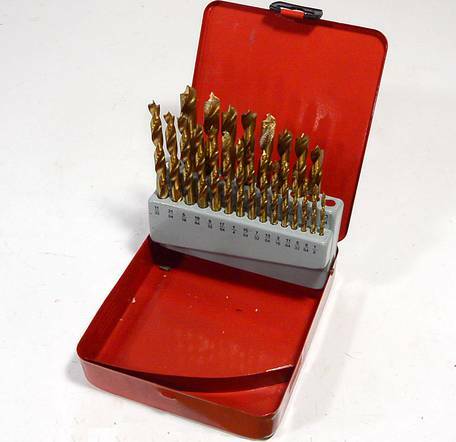 I always found the drill index a little awkward to use in its original case, and I never ended up taking it out of the shop. Mostly, the case just ended up getting wood shavings lodged into it. So I cut up the metal case, and made a wooden base that the rows of drills are inserted in to. My brad point drill set on the other hand came in a plastic case. I cut the bottom part of it off, and hot glued it onto a piece of wood to keep it from tipping over. Much easier. 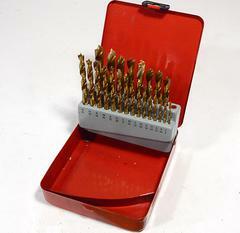 My forstner bit set, with drills going up to 2" in diameter came in a nice wooden case. But keeping it near the drill press, it always became filled with wood shavings. So I finally decided to just make a shelf to hold all these drills. 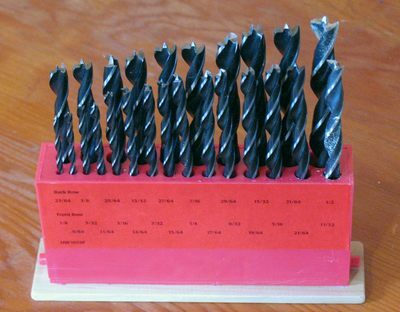 For the larger drills, I drilled a really shallow hole at the base of each one so that it's easy to check which sized drill goes in which hole. I don't use the larger drills all that often, so I decided to make more holes for more drills and accessories in front of those. On the left side, there's a bit of room which I may well drill more holes into to hold more stuff. For the time being, it's a place to put the brad point drill index. All the holes for the drills are drilled through to the bottom, but with the bottom part of the hole a smaller diameter. That way, any wood chips that might get into the holes can fall through to the bottom, without allowing the drills to fall through the holes. 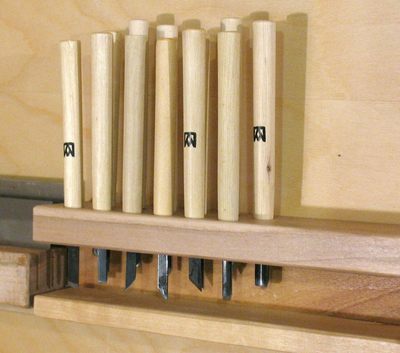 A holder for some carving tools. I wanted the bottom of the tools to be visible, so I know which tool I'm grabbing. But at the same time , didn't want the sharp ends to stick out of the bottom of the holder. So this holder has a sort of C profile. The bottom part is really just there as a guard. Holders for some squares. 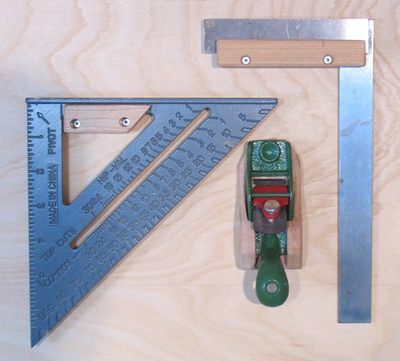 The right square is a machinist square. 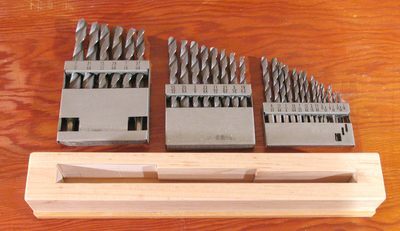 The left square is a rafter gauge. Both very trustworthy as squares. The rafter one is cheap but very trustworthy as a square, seeing that it would have to be totally wrecked to ever go out of square. In the middle is my small palm plane. 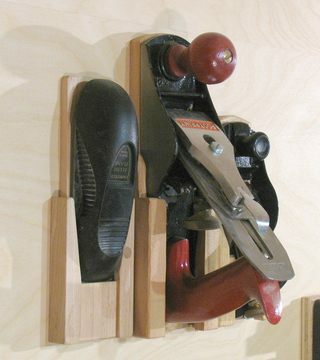 I use this one a lot - mostly for putting a slight chamfer on the edges of work pieces. Chamfering the edges makes furniture feel much nicer to the touch, and it's a lot faster than sanding the edges round. Even for sanded round edges, it's less sanding to start with a chamfer. 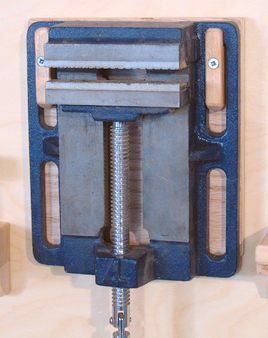 A holder for the drill press vise. Just two hooks on a piece of plywood. The piece is screwed onto the backing through the hooks. That way, the hooks are not prone to breaking off with the relatively heavy vise. And a holder for the small bar clamps. 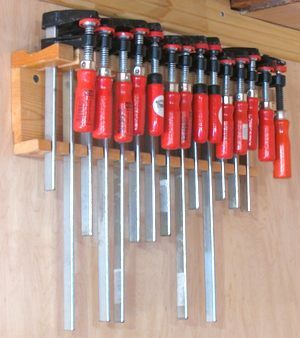 This isn't on the same wall as the rest of the tools holders. Note the profile of the top piece (see edge at left). It's shaped that so the small clamps nestle nicely in the top and stay vertical. ... That was in 2008. As of 2012, that wall has gotten quite full. 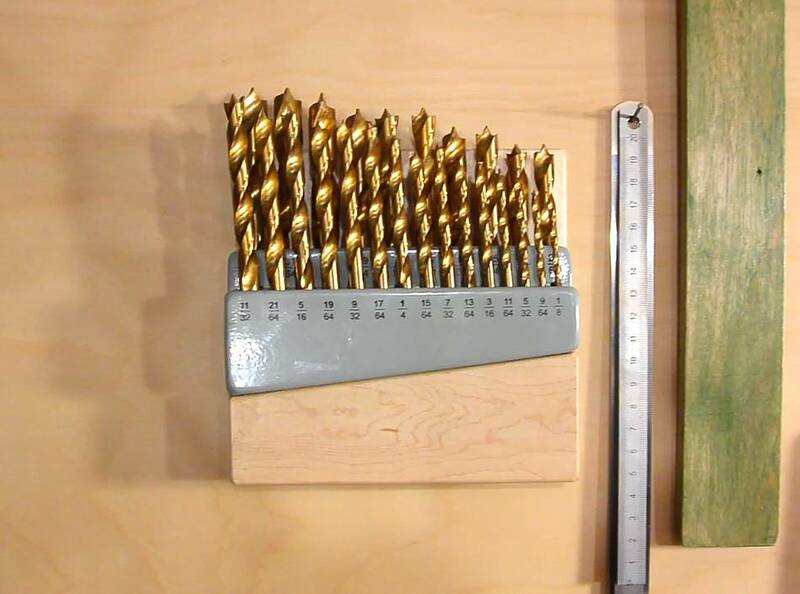 I added another drill index to my walll, thos one of forstner bits. I extracted the drill holder from the index to make the mount. And this time And this time, I took the opportunity to make a video about the drill holders. 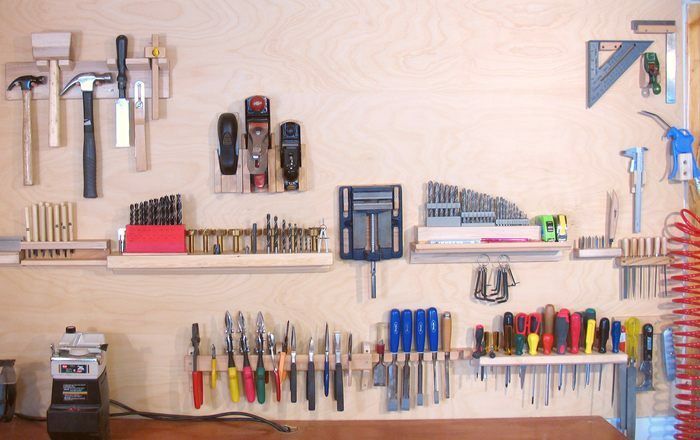 Update 2017: On moving to the country, I took this tool wall with me because it was made for my best tools, swapping out these ones to make room for it.